Happy Valentine’s Day! I chose today’s between the ears shot because of the love story behind the picture. A little over a year ago my mom came home from a buisness trip and excitedly explained that she had met my Tennessee twin. On the van from the hotel to the airport she saw the young blond thumbing through a few pictures of horses on her phone. As they chatted Katie told her about growing up with horses out side of Nashville and her upcoming trip to New Mexico with her boyfriend Derrick. 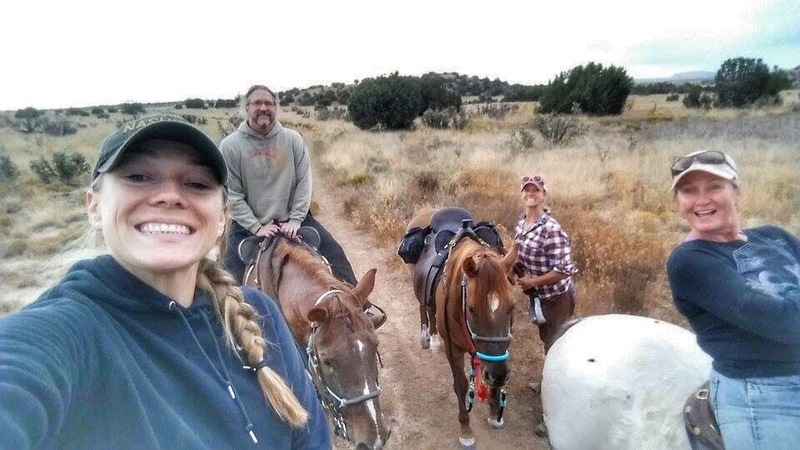 Naturally Mel invited the pair to stay at our ranch for a few days and take them on a day ride. 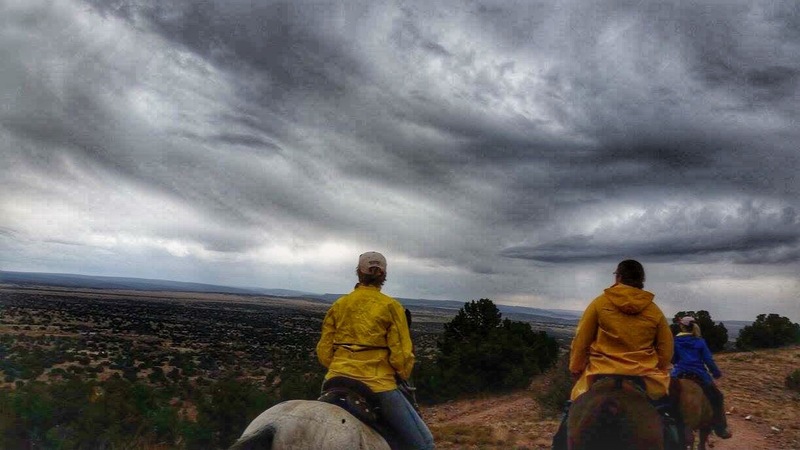 On a stormy October day we trailered out to Galisteo Basin with Katie and Derrick. I love this area for its sandy arroyos, painted desert walls and unbroken vista views. Although Katie had been horseback all her life, much like I had, Derrick had only been riding for a year. His natural ability was evident as he became buddies with our Quarterhorse draft cross, Teddy. Derrick understood that horses are Katie’s passion and he invested his time into her passion because he loved her. He not only learned to ride but proposed to her the night before. 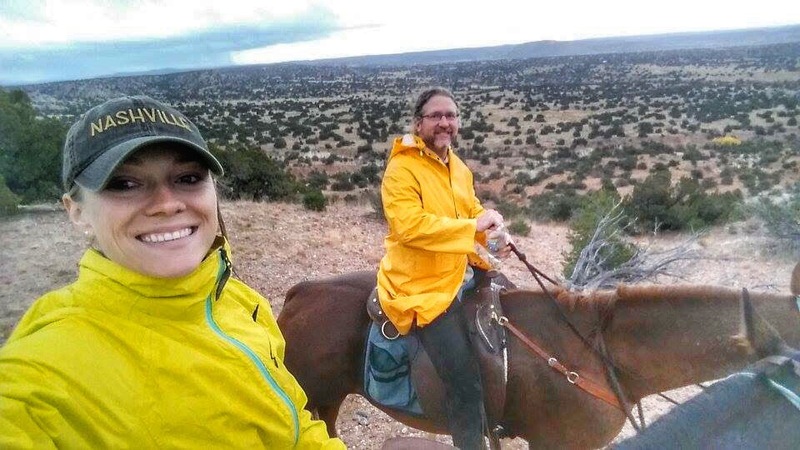 This was their first ride together as finances, as two people starting a life together with a mutual equine infatuation. I still keep in touch with my cowgirl sister, her fiancé, and their budding equestrian business. There’s is the quintessential Valentine’s Day story of two souls falling in love from the back of a horse. This winter has been tough on my riding schedule. It’s been nonexistent. 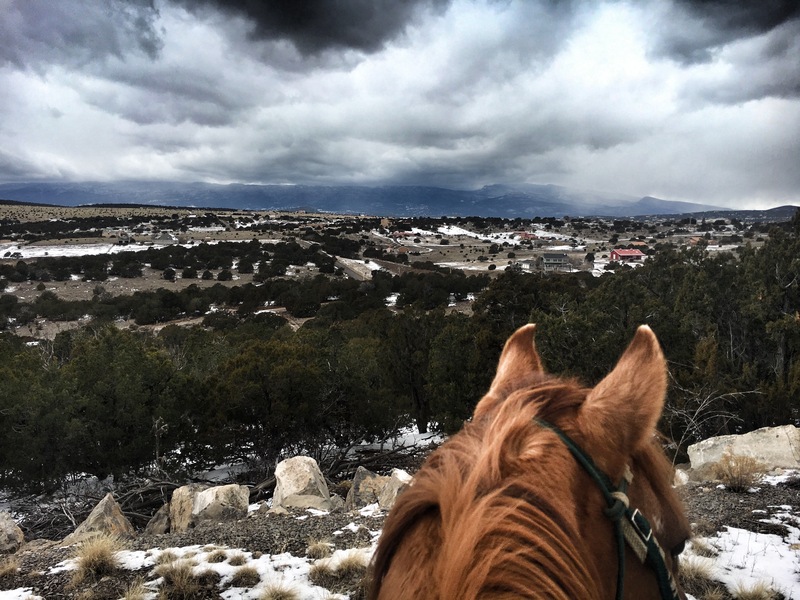 I love riding with snow crunching under hooves and fat flakes catching on eyelashes, much like the day when I captured this lazy winter storm looming over the mountains. I live for these days, but they have been few and far between this year. Usually the afternoon sun peaks out, transforming snow into a sloppy, slippery mess unpleasant to walk in and undearable to ride through. However, I keep trudging through muck and mire, waiting for when the world is covered again in a blanket of white and the stillness is broken by breath puffing around my horse like dragon vapor. This winter can be a bit like life, mucking though the slop to grasp a magical moment, no matter how fleeting. 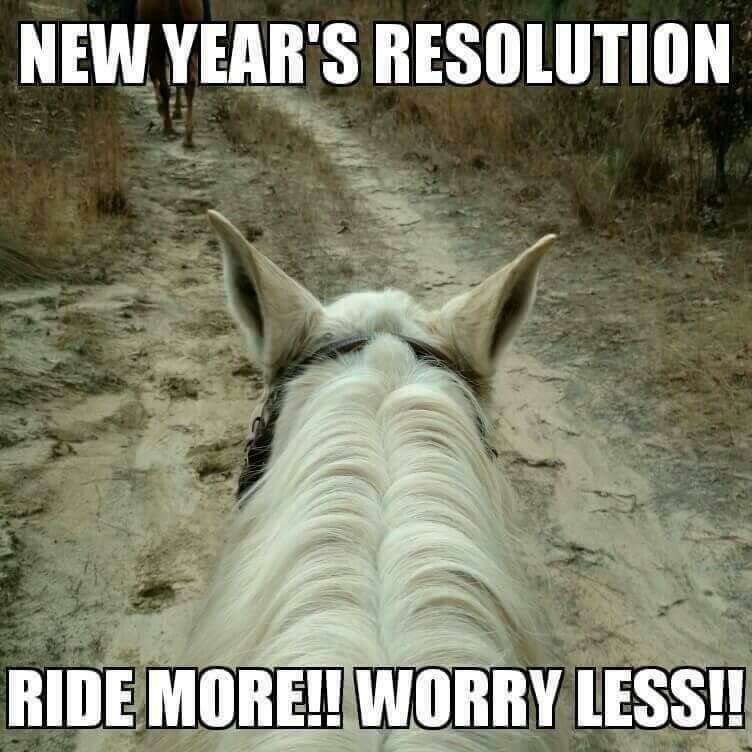 After a holiday hiatus from posting I’m back with this reminder to ride more and worry less. I found this meem plastered all over Facebook, being shared and re-shared, liked and loved. I don’t often make New Year resolutions because they usually get neglected and abandoned when they become unpleasantly inconvenient. However, it’s easy to be resolute about something that you already love. I believe that equestrians can all agree that there is something about being in the saddle that melts away stress. It could be the rhythmic movement composing a moving mantra, or the companionship of a silent partner who listens to your every concern, or that being out in nature seems to slow down time like a leaf floating from a limb. A few nights ago I dreamt about galloping across an open field on my favorite thoroughbred. 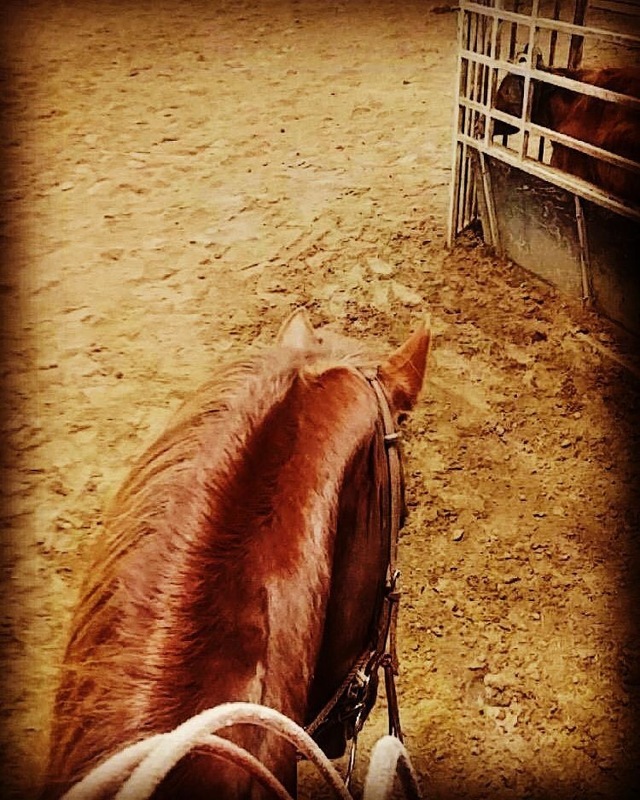 It made me realize that I have been out of the saddle too long and have let my worries settle in too deep. So I’m making a promise to my self this year to get on the back of a horse more and leave my troubles behind. I hope that you too can add this to your resolutions list or simply make more effort to ride this year. This pictures was posted a few days ago by a childhood friend. We haven’t actually seen each other since elementary school but with the ever updating world of Facebook I’ve been able to keep up with his beautiful family. Our dads were both team ropers and while I can swing a rope at a dummy, Reed still chases a few steers. This photo should be in a magazine with big block letters across the top promoting a high performance suplement for horses. Instead it is a superbly captured moment of a horse ready to do his job. His eyes and ears remain pinpoint on the cow, intensity builds in his arched neck, he waits to spring as the gates slam open. 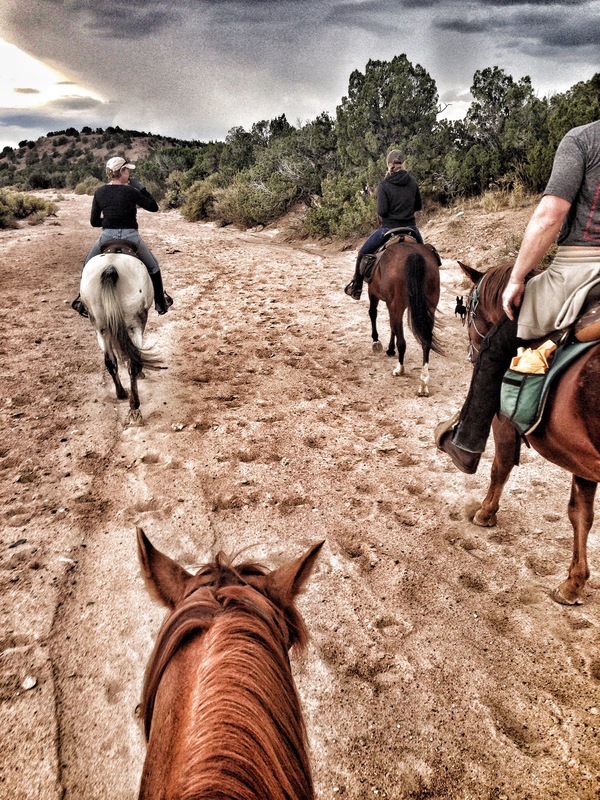 Any cowboy will tell you that half the work is done by a good horse. This is a good horse that loves his job. I wholeheartedly believe that domestic horses need and want a job. With the cold weather and shorter days setting in, my herd has spent most of the past month napping and eating in their paddocks. This may seem like the good life but, like kids cooped up in house too long, it makes for irritable, moody, and bored horses. Their manners begin to slip, nipping at each other at feed time or getting pushy at a gate. We often have to revert back to foundation training. “This is my space, this is your space, get out of my space,” kind of schooling. My horses love their trail riding job and in the winter months I have to employ a parental like ingenuity to keeping them stimulated and out of trouble. Like Reed, many owners can keep their horses working year around. My horses work seasonally, which leaves at least 3 months of down time. I’m hoping to fill some of those days with romps in the new pasture when the weather is nice. Just getting horses out on the walker or out on a lounge line helps. How do you keep your horses fit and entertained during the winter? With the cold weather and short days limiting riding most of my time with the horses is spent in the barn. Today’s photo is of Bozly patiently waiting for my mom to bring him his feed bucket. At 34, the old man gums a warm Timothy pellet and beet pulp mash twice a day. 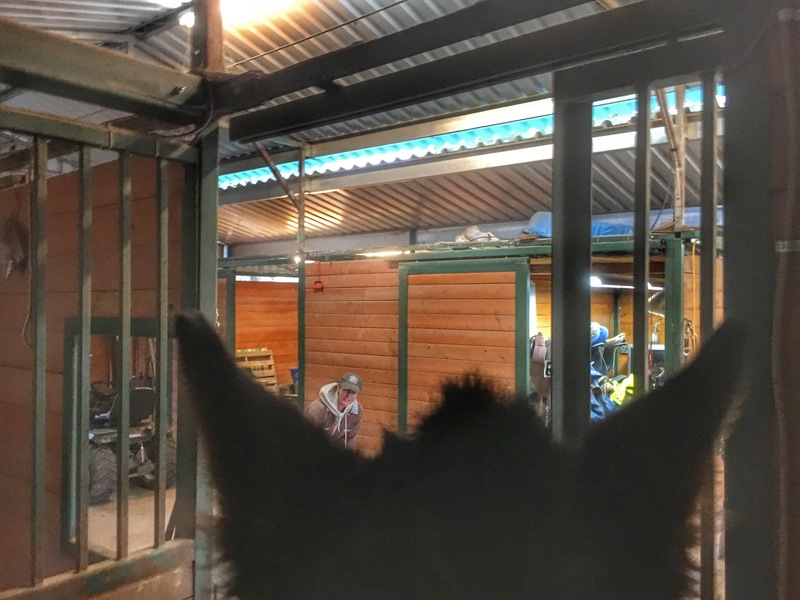 We leave the stall door open so he can peak his head out to nicker encouragement. When the wait becomes unbearable he wonders over to the feed room to observe the progress. As soon as his bucket is picked up he skips back to his stall and tucks into his feed grunting happily. Bozley’s pure excitement makes my day. Today’s shot took place on the last warm day of the season. We celebrate our Thanksgiving the Sunday before and I was very thankful to escape the kitchen for a few hours to take a few friends on a trail ride. The ears belong to Mia, my mischevious red dun mare. The love birds holding hands, Patience and Mark, rode Boz and Cisco. The whole ride Patience would giggle every time Boz would trot. “He’s got a lot of go for an old guy,” she would say. Boz is 34. It was a reunion for Heather and Zena. Heather had ridden the pretty Appaloosa mare when she was still at the rescue 5 years ago. It was Heather who urged us to work with Zena, who was ill mannedered but an amazing ride. Now Zena’s manners are much improved and Heather couldn’t stop gushing over her training. Our ride wouldn’t be complete without my outrider Paige giving some much needed exercise to Rain, our bay baby. 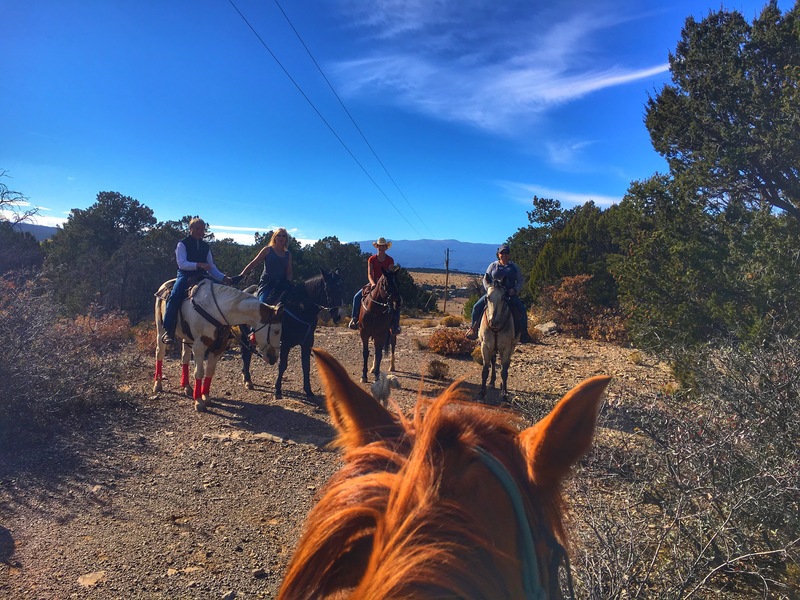 The wether couldn’t have been more perfect for late November, my horses were on their best behavior, and the company was full of laughter. It was a day to be thankful for.